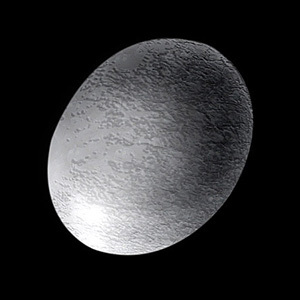 Haumea is a dwarf planet and plutoid found in the Kuiper Belt. It’s the fourth largest dwarf planet, it is roughly the same size as Pluto and it has one third of the mass of Pluto. Haumea is one of the fastest rotating large objects in our solar system and completes a full turn on its axis every 4 hours. Due to the fast rotation, the planet has become elongated in shape – one of the strangest shaped planets or dwarf planets that we have discovered in our solar system so far. Haumea is named after the Hawaiian goddess of childbirth and fertility. Read on for some more facts about the plutoid Haumea. Haumea was first discovered in March 2003 at the Sierra Nevada Observatory in Spain and it was officially announced in 2005. It takes Haumea 285 Earth years to complete a full orbit of our Sun. Haumea has two moons, Hi’aka and Namaka. It is thought that these may have been created billions of years ago by a large object impacting against Haumea. Scientists believe that Haumea is made from rock with a coating of ice. 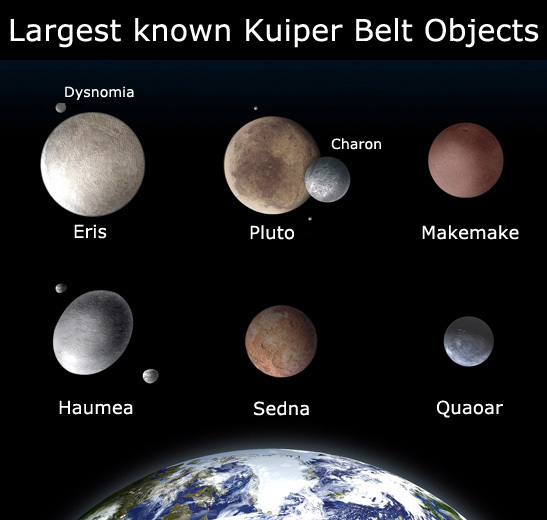 Haumea is the third brightest object in the Kuiper belt after Pluto and Makemake. This makes is possible to see Haumea in the night sky with a good quality amateur telescope.